My friend Rachel got me thinking about the story of Abraham and Isaac again the other day. I think the first time I really gave it any deep thought was in reading Kierkegaard’s famous meditation on the nature of faith in Fear and Trembling. The entire thing is an examination of Abraham’s terrible choice, his decision whether or not to offer up Isaac as a burnt offering to God. (Actually, on a biographical note, that book’s partially responsible for me being married to my wife. But that’s a story for another time.) I took up the text again in seminary, ended up looking at some of the rabbinic treatments of the issue, and wrote a short paper on it. In any case, upon reading the story the question comes up for many of us, “Would we? Could we ‘pass’ that terrible test of faith that Abraham did that dreadful day?” I don’t have a child yet, so I can’t say I know the full reality of what it is to love a son–let alone an only son. I love my nephew and to even briefly consider his loss fills me with terror. To think that my God could command that I perpetrate the deed is terror upon terror. In good conscience, I don’t think I could do it. But here’s the thing, if I were Abraham I’m not so sure what I’d do. All too often in these discussions of troubling texts, we collapse the cultural distance between us and the biblical characters. Human nature is, in many ways, constant. Conscience is one of those basic human features. Across cultures, everybody has a clear sense of right and wrong, norms against which we must not cross, and an internal compass about these sorts of things. That said, any student of culture knows there are some significant variations across cultures as well. “Self-evident truths” held by post-Enlightenment Americans are not all that apparent to equally intelligent Middle Easterners or citizens of the Majority world. The conscience of a 1st Century citizen might be very sensitive about an issue you and I wouldn’t blink twice about, and vice versa. Our cultural presuppositions and plausibility structures do a significant amount of work here. Where does this come in with Abraham? Well, I think it becomes a factor in two ways: cultural distance and revelational distance. These two are bound up with each other. First, it’s been said by biblical scholars before, but it bears saying again: child sacrifice was fairly common for a number of Ancient Near Eastern cults of Abraham’s day. * We have archeological digs filled with tiny human skulls and skeletons that were burned in the fire. At least two of early Israel’s neighbor competition deities, Molech and Chemosh both demanded child sacrifice. Abraham was a recovering idolater in this context. He didn’t grow up in church, Sunday school, or youth group. He grew up around idols, sacrifice, and the pagan gods most of his life. He didn’t live in the 21st Century West. I’m not a cultural relativist, but we neglect this reality much to our harm when it comes to these texts. For Abraham to receive a command from the God he’d been following for some years now was not unintelligible. It wouldn’t be easy, or simple, but it wouldn’t be unthinkable to him. In Abraham’s mind, the firstborn does belong to God. In fact, that’s actually a deep truth that runs all through the Bible. The firstborn does belong to God as you can see very clearly in the principle of the Passover (Exodus 12) and the redemption of the firstborn and their replacement with the Levites (Numbers 3). Without this, you can’t understand Jesus’ role as the firstborn who redeems all of creation (Colossians 1). God was testing him according to his own standards of ultimate devotion even though he had no intention of accepting it. Still, what differed with God was the mode of the offering of the firstborn. Abraham didn’t know God’s character. A few encounters over the years isn’t a full bio of God. Remember, in Genesis 18, with the destruction of Sodom and Gomorrah, Abraham still thought he had to talk God into being merciful. He didn’t know God’s commitment to life and that he’d only come to judge a once it had become so wicked as to have less than ten righteous people in the whole thing. And so, God “tested” him, and taught him through that haggling experience. In a very similar way, God was testing him according to his own standards of ultimate devotion even though he had no intention of accepting it. Did he have as much devotion to YHWH as the idolaters did? As much devotion as he would be willing to offer them? God tested him, and then revealed himself to Abraham as the gracious Lord, who provides the sacrifice. Israel’s kings even made their children pass through the fire in the valley of Hinnom outside the gates of Jerusalem. The people built high places. Apparently this was the kind of thing that it was very tempting for Israelites, even after Abraham’s day to do–to offer up sacrifices, the fruit of their love, to their gods in the fire. Abraham didn’t have that either. So when I say, I couldn’t, I mean it. I’m not an Ancient Near Easterner. I’m also not a recovering idolater (well, not in that sense.) I’m a Christian who has a Bible and knows the revealed character of God. God has strongly commanded that these things are evil and contrary to his purposes. So if God came to me today with these commands, I’d probably think it was a demon because he has clearly forbidden it in Scripture and, contrary to some popular readings, God doesn’t simply contradict himself. There’s one more difference, though, between Abraham and myself: I’m not always sure I have his faith. See, if the New Testament is any help in understanding the story, apparently Abraham didn’t expect to walk back down the mountain alone that day. I suppose this is what Kierkegaard was talking about when he spoke of the difference between the knight of infinite resignation and the knight of faith. Infinite resignation sacrifices the child believing that’s the end of it. Faith believes God’s good and he’ll give the child back. Abraham believed the knife wasn’t the end of the story. He thought, in some mysterious way, he was coming back down the mountain with Isaac. There’s always more to say, but I suppose I’ll end with a word about conscience since that’s what provoked some of these meditations. We give ourselves a lot of credit on this one. We think the same thing about Germany and WWII. “I would never participate in that.” But most normal Germans did. At the right time and place, with the right cultural history behind us, many of us would do a lot of things we never would imagine doing now. I mean, in our own ways, we do. Today there are a great number of men and women who honestly, legitimately think according to their conscience they are doing good by defending a woman’s right to choose an abortion. Of course, if a certain line of moral reasoning is true, then Abraham’s choice begins to look a bit closer to us in the 21st Century West. And we’re vocal about it. That’s how disoriented a strong conscience can be. This is why, though Scripture tells us that conscience is important, and we ought not sin against it (Romans 14), we probably shouldn’t make it the final judge of things (1 Corinthians 4:3-5). We need to listen to our conscience, to be sure, but we also ought to submit them to the Word in order that we might be transformed according to the renewing of our minds so that we can know what God’s good and perfect will is (Romans 12:1-2). That doesn’t mean we should stop questioning, thinking, reading, studying, and just settle for the first, obvious reading of any text we come to. No, all too often that will lead us astray and may even lead us to affirm things out of “deference” to God that he himself would never affirm. Some more Kierkegaardian wrestling on this point would probably do the church some good. All the same, as Christians we confess that God is God and God is good. And so we will trust his word and wrestle with it until we can his goodness in it. We will struggle until we can offer our consciences up to God and ask him to teach us, trusting that we will receive them back whole and healed. And thank God, I think he is patient with us in those times. *See Jon D. Levenson’s excellent The Death and Resurrection of the Beloved Son. **For more on this, see The Rise of Christianity by Rodney Stark and Atheist Delusions by D.B. Hart. Good thoughts -I’d also add that the story has to be read ‘canonically’, since the object of Abraham’s faith was the resurrection, which Isaac can be seen as a type of. This is by far the most charitable response to that post I have received, so thank you, Derek, for the thought-provoking post. Maybe I shouldn’t have started with the Abraham story because this post isn’t really about the Abraham story alone. It’s about how, even though we like to say we live in full submission to God & Scripture alone, I’m not sure that we really do. I think we all actually have a limit, and I think that limit manifests itself in the reality that very few of us would sacrifice our own children/ commit genocide/ endorse slavery/ etc. even if we were convinced our religion required us to. I think many of us would sooner leave the religion than violate our conscience to that degree. Things like the “age of accountability” reveal this reality. That theology is an accommodation based on conscience. It’s certainly not an explicit teaching in Scripture. So my point is: Yes, we do at time elevate conscience over Scripture, and maybe that’s okay. Also, if faithfulness is about rigid obedience in spite of conscience, reason, intuition, etc. it seems really unfair to expect Muslims, Buddhists, etc. to convert to Christianity based on any of those reasons. If total submission to one’s faith is the highest virtue, we cannot expect to compel anyone to change their faith, even in light of compelling moral, intellectual, and theological arguments. Huh, but that’s not what I’m saying. Also, I think the revelation of Jesus Christ trumps those faiths. I am NOT saying that we can never use reason or history or anything like that to evaluate these claims. I am saying that in the case of the Bible, our faith is warranted in the face of these objections. I don’t think this is mirror special pleading either. My faith in the Bible, is caught up in my face that God is the God of the resurrected Jesus Christ. No other religious faith has that warrant. Are we forgetting the work of the HS here? He, is the only reason true Faith comes. Acceptance of Jesus based on inferior influences is fragile at best. Maybe it’s not so much that we elevate conscience over Scripture but can use conscience as a God-given tool to help us make sense of it. At bottom I agree with your objection – few of us would sacrifice children/commit genocide/endorse slavery/etc. if our religion required us to, but these things would be out of line with God’s character as ultimately revealed through Christ. I don’t think this invalidates the troubling passages as genuine revelation, or even explains them, necessarily, but it can give us some sense of what they are NOT saying. Like you, the God of the “God is God and who are we to question him” mindset is deeply scary to me. God is the source of all that is good, and although our understanding of that good might be flawed and in need of correction, we nevertheless need not fear him. “Every good gift and every perfect gift is from above, coming down from the Father of lights with whom there is no variation or shadow due to change.” The “God is God” mindset seems to mistake God’s bigness for arbitrariness, and it is impossible to understand or trust such a God. As you point out, to preach such a God is to preach relativism. The stories you describe in your blog post don’t seem to me like people rejecting Scripture in favor of conscience, but discovering through experience that their denominational reading of Scripture did not hold up to reality. BTW, thanks for another great post, Derek. It never occurred to me that Abraham might have viewed human sacrifice as reasonable, and this reading of the story both makes sense and is beautiful. Regarding the possibility of infant salvation, I’ve certainly heard the case overstated, but there really are exegetical arguments in favour of it that are worthy of consideration. I don’t deny that hope plays a role in my thoughts about it, but I wouldn’t consider it if I wasn’t convinced that David would go to his child, or that our guilt was established in part by our knowledge of it, etc. The point is, I think it’s incorrect to say we believe it purely because we desire it to be so. I used to think it was unfounded and most likely incorrect till I was persuaded otherwise, and I didn’t thereby conclude that God was unjust. That’s what I thought too, Rachel. Thank you, Rachel, for being vulnerable about your doubts and struggles in faith – which many of us (including me) share or have shared at some point. And, thanks Derek, for being charitable and engaging her thoughts rather than simply dismissing her as not sufficiently theologically informed and possibly a heretic as I’ve seen others do. the point of the Abraham and Isaac narrative is, first of all, that Abraham *did* live in full submission to God and His word; that’s why he did not hold anything back from God – even the thing that was most precious to him. So I think we need to start there, regardless of what we feel we may, or may not, do today. The second thing – as I see it – is perhaps that we need to read that narrative, not like we read the narrative of Jesus and Nicodemus, but like we read the narrative of Jesus and the rich young ruler in Matt. 19. The corollary there is that Jesus is not asking all Christians today to sell everything we have and give it all to the poor but *he was asking the rich young ruler specifically to do that* then; in the same way that God isn’t asking us to sacrifice our kids on an altar today but He *was* asking Abraham specifically to do that then. We see similar specific pressings, for instance, in Jesus interaction with the woman at the well – He is always pressing on one specific place in individuals He encounters. The sum is: what is that supreme love of your life – whatever it may be for you – that you place above God in your heart? It may be a child, or a spouse, or a job, a theological position, a conscience – for Abraham it was the child he and his wife had dreamed of having all their long lives. God knew that for Abraham (or any of us) to remain faithful servants in His kingdom, He alone must have the highest place in our hearts. The third thing is that God Himself *did* put His Son on the altar/cross and *did* slaughter Him. In turning away in revulsion from Abraham’s sacrificing of Isaac are we making ourselves morally superior also to God Himself? With all that in view, yes, we certainly *do* place our conscience above God and His word lots of times; but we only do that to the detriment of our joy and His glory. Is it your conscience that tells you that the God revealed in the Bible is good? Because if it is, then wouldn’t your conscience ultimately have the final say and not the Bible? I’ve never been a believer (my Catholic education never really took) so I honestly don’t know how the thought process goes, but from the outside it seems to me like everyone who reads the Bible judges God. Theists judge him to be worthy of worship, non-theists judge him to be not worthy of worship (if he exists), but all are using the same faculties to arrive at their decision, right? Maybe I’m missing something. Hey, good question. I would say that the conscience is not the main intellectual organ by which we believe or don’t believe something. I’m not sure there’s a good term for it, but you might speak of a faith-faculty in there. It is the intellectual/volitional component of your heart/mind that trusts and believes things. We all have it and we all use it. Though it is not the same thing as the conscience, which is concerned more with moral knowledge and the recognition of the moral field, conscience does inform it. One way of thinking about the “judging worthy” and “judging not worthy” is to think of faith as a “judgment” of recognition. When I “judge” God to be worthy of worship, in that very act I am judging him to be my judge. I am recognizing him for who he is. To judge otherwise is to set yourself over the picture of God given in Scripture and say it does not measure up The same faculties are involved, but the movement is different. I’m not sure if that helps, though. 2) I think it’s important to emphasize the degree to which Abraham’s faith in the resurrection animated his actions. The author to the Hebrews isn’t imposing resurrection faith on the Genesis text. In Gen. 22: 5, Abraham tells his servants, “Stay here with the donkey; I and the boy will go over there and worship and come again to you.” Both of them will come again (plural in the Hebrew). The author of Hebrews, affirming that Abraham spoke the truth, takes this as a confession of resurrection. Abraham believes he can go up the mountain, sacrifice his son, and that the Lord will raise him from the dead then and there. Why would Abraham believe this? Because he’s already seen God raise Isaac from the dead. This is the child of promise, born from a barren womb post-menopause. Abraham has known the God of new life, of resurrection. What’s more, he has believed God’s promises. God said, “Through Isaac shall your offspring be named” (Gen. 21:12). Yahweh has linked his promise to Isaac, and been very specific about it. “Not Ishmael,” says the Lord. “Isaac.” The combination of the specificity of God’s promise to bless the nations in Isaac, and God’s miraculous act in causing Sarah to bear is what lies behind Abraham’s faith. Yes, these are excellent additions. This was part of what I looked at in my earlier study in seminary. Also, thanks for the link. I’ll be sure to check that out. Our start and end point in this and all matters is what SENSE does this make in relation to what the HS reveals to us about Jesus and therefore God as he is the EXACT representation of Him. However abhorrent the actions seem or are they serve to tell us something important about God or what is important to Him and this justifies these acts. Where what we COULD infer about God from the actions differs from Jesus it is incorrect. That Abraham may not have shared our visceral repulsion and sense of outrage to the sacrifice of his son is not the point. We do know that Isaac represented God’s greatest promise to him and was how God most powerfully revealed His intentions to Abraham. The story shows the value God puts on absolute trust in His character and beautifully demonstrates that though he spared Abraham that sacrifice, out of love for us He did bore it Himself. Do we have the guts to say that to people, in whatever ways we can best say it? This is the great offense of Jesus. This is why they killed Him. However, if you don’t have time to answer to those question, thank you alot for this though provoking article. Guess, that will give me a renewed eye on some of the old testament texts that I am reading right now. Derek, I hope my perspective can further your ideas by adding a variable perspective. I’m a grad student in anatomy, meaning a dominant part of my education is dissecting cadavers. I’ve gotten pretty used to it, for example I eat lunch while watching demonstration videos. But I have friends with whom I can’t even talk about it with lest they lose their own lunch. But really, you get used to it and it doesn’t seem as weird or gross. But even still, my boss’s work of autopsies on babies and fetuses intimidates me and scares me. Seeing pictures of malformed fetuses is heart breaking, but he is totally used to it and completely unfazed. And it’s a good thing he isn’t because he helps determine if those parents who lost a child are in danger of conceiving more with similar pathologies. Perhaps our exposure may impact conscience in a way separated from morals. We aren’t used to marauding hordes and war spoils, blood and violence grosses us out, and we aren’t in danger of being brutally murdered by enemies. I realize this doesn’t explain everything in the OT, but I do wonder how much we find morally repulsive merely because it makes us queazy. I’ve come a bit late to your thoughtful, thorough and courteous blog. One thing that intrigues me is this comment by Rachel:’…very few of us would sacrifice our own children …even if we were convinced our religion required us to.’ I have never been called by God to sacrifice any of my children, and I have no idea how I would respond if I believed I had been called to do so. Any comments I might make on that now, in my ‘uncalled’ position, would just be speculative…and probably similar to the comments Rachel has made. For me, the important thing is that Abraham was called to prepare to sacrifice Isaac, and he faithfully obeyed God’s leading. I believe God equips us to be and do everything He calls us to be and do. I have also not been called to die an agonizing death on a cross. When I think now from my comfortable armchair position about the prospect of me dying on a cross, I think my response to that might be something like:’It’s not fair! This is a witch-hunt!’ Yet who knows what my response would be if I were called to martyrdom by God… and equipped for that calling? Thanks for the thoughtful response on this issue. I did have a clarifying question for you. You stated, ” . 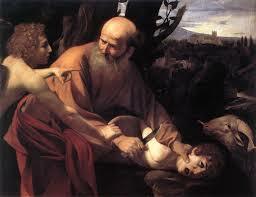 In Abraham’s mind, the firstborn does belong to God.” How do you back this statement up? Are you deducing this from Abraham’s brief encounters with God up until that point or is this residue from his idolatrous ways? This post is from a while back. I decided to read it because I saw the movie Abraham last night. The comments in the post are good because they provide an interesting discussion of the role of conscience in approaching the Bible.